so when you realize that the cost of entry is only £2. 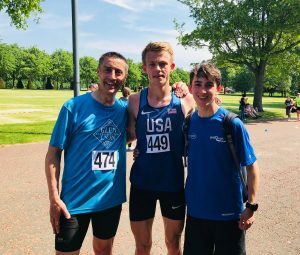 Following on from last month’s record-breaking runs by Fiona Matheson and Peter Fleming, this month we smashed the all-time record for a Scot running 3k with Giffnock North’s Luke Traynor romping home in a time of 8:20, the third fastest ever 3k run in the UK. Only Mo Farah 7:57 and Chris Davies 8:18 have recorded faster times, both in Newcastle on the 29 Sept 2007. Luke took eleven seconds off of the previous course record of 8:31, held by James Bowness of Trafford AC. We may also have smashed our own record of number of females participating in the event with some 37 women taking part in the event and there was quality as well as quantity with Victoria Park’s Anna Tate crossing the line in 9:43, just two seconds off of the course record of 9:41 held by Inverness’s Jenny Bannerman. 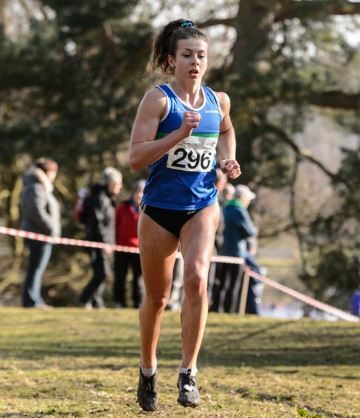 Anna’s run was the second fastest 3k ever run by a woman in Scotland. 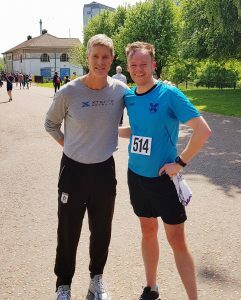 With former Scotland Football Team captain, Richard Gough supporting and temperatures reaching 23C, the 122 runners set off in the lunchtime sunshine. This was Luke Traynor’s debut 3k and he included it in part of his training schedule, doing 2 x 3k runs immediately prior to the 12:30 race. 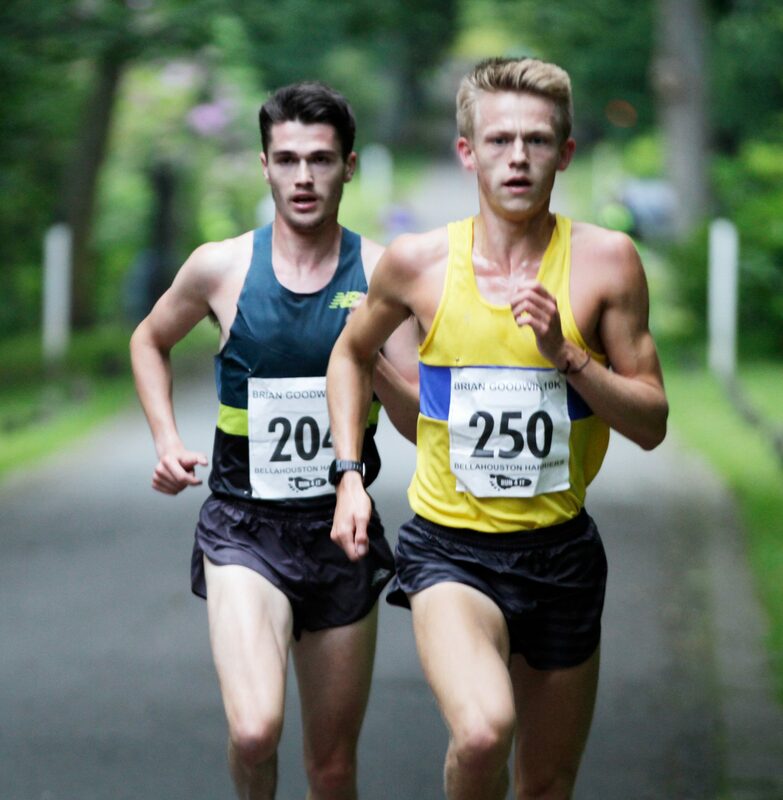 He had warmed up well and boy did it show as he darted off from the ‘go’ and raced home some 25 seconds ahead of Cambuslang’s Craig Jardine who ran a PB of 8:45. On his second outing, Shettleston’s bandana wearing Paul Sorrie was six seconds slower than in April, earning Bronze with a time of 9:15. A total of fourteen runners placed under 10 minutes for the fast, flat and accurately measured race, including Victoria Park’s 1500m specialist Anna Tate who won the women’s race in 9:43. Fellow debutant, Rebecca Johnson of Edinburgh University placed second with her time of 10:03, with Shettleston’s Jess Brydon making it three out of three for the newbies by earning bronze in 10:41. The best age grade performance of the day was run by Erica Christie who also won the W60 category with a time of 12:35 and a wava of 90.59%. Nice !! The 3K on the Green is a great wee event. Since I train alone I enjoy incorporating a race into my sessions to break it up a little. I would like to have another at that course on fresh legs and see how fast I can go. Please note that there will be NO race in June as Glasgow Green is being used for another event but we will be back on Friday 27th July and hope to see you then.